My dear friend F is always in search of the perfect bite (il boccone perfetto)! Whenever she can find herself in front of different options, she struggle to have a mounthful of a combination of ingredients just to obtain the perfect blend of flavours and texture all in one bite, that goes directly in her mouth. For instance, last time we were delighted, by another friend of ours, K, with some options as quick entrées before the main course: a well aged Camembert, ham mousse, fried artichokes (her pièce de résistance, or cavallo di battaglia, as we say in Italy) and some rye bread. Well, F took a little piece of everything and she made her personal perfect bite: a piece of bread, a thin layer of ham mousse over topped by a piece of Camembert, to finish with a thin, just fried artichoke. Who can blame her or her search! 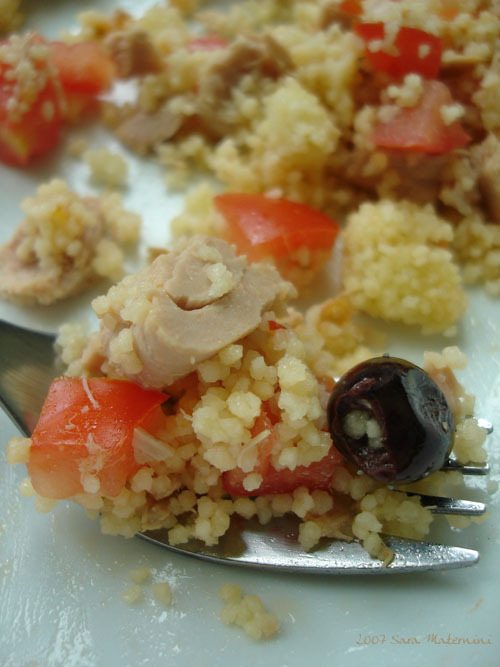 So, this little perfect and simple bite is dedicated to F and it’s composed by some couscous, tuna, tomatoes and olives with a bit of good extra virgin olive oil… And if you can find some fresh basil, even better! This really sounds like il boccone perfetto!